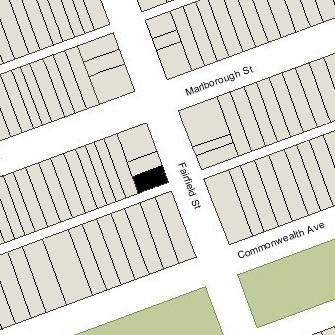 9 Fairfield is located on the west side of Fairfield, between Marlborough and Commonwealth, with 7 Fairfield to the north and 21 Fairfield to the south, across Alley 427. 9 Fairfield was designed by Ware and Van Brunt, architects, and built ca. 1872 for builder and contractor George Martin Gibson, for speculative sale, one of two houses (7-9 Fairfield) built in the same style. At about the same time, Ware and Van Brunt also designed six additional houses for George Gibson: 282 Marlborough (contiguous with 7-9 Fairfield but in a different style) and 284-286-288-290-292 Marlborough. George Gibson and his wife, Frances Rebecca (Esten) Gibson, lived in the Longwood district of Brookline and then in Medford. George Gibson acquired the land for all eight houses on March 22, 1872, from Edward John Hale, who was associated with John M. Forbes & Co., shipping merchants and investors in railroads, mining, and other enterprises. Edward Hale and his wife, Justine Elise (Sewell) Hale, lived at 3 Brimmer. Edward Hale assembled the parcel through three purchases in October and December of 1870. All of the land was part of one of several parcels originally purchased from the Boston Water Power Company on January 29, 1866, by a real estate investment trust formed by John Templeman Coolidge, Franklin Evans, and Charles Henry Parker. The trust had subdivided the property into lots, which it sold to investors and builders, who then frequently resold the lots to others. The houses at 282 Marlborough and 7-9 Fairfield were designed with a 12 foot 4 inch open area between them and the house to the west at 284 Marlborough, forming the side yard of 282 Marlborough and the rear yards of 7-9 Fairfield. When he sold the houses, George Gibson included language in the deeds specifying the right of 284 Marlborough to maintain bay windows and chimneys extending over this space. 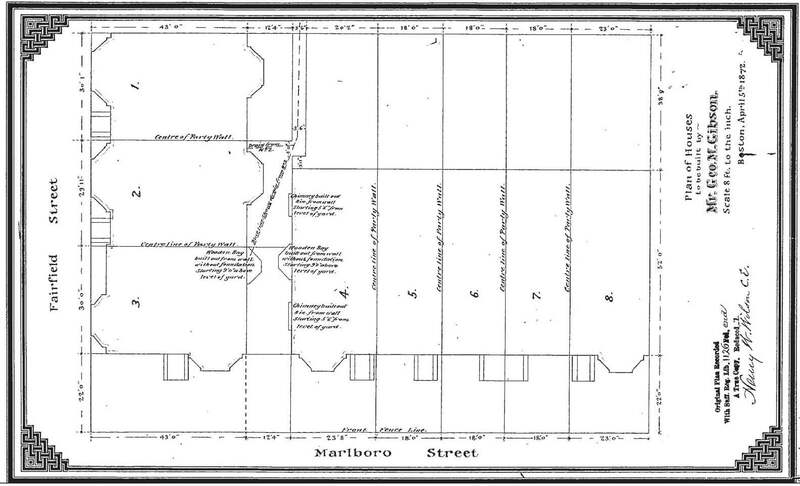 The deeds also provided for a three foot six inch wide easement at the rear yard of 284 Marlborough to provide for passage to the alley for 7 Fairfield and for drainage to the alley for 7 Fairfield and 282 Marlborough, and an easement under the rear yard of 7 Fairfield, running diagonally to the passageway in the rear of 284 Marlborough, to provide for drainage to the alley for 282 Marlborough. Click here for an index to the deeds for 9 Fairfield. On October 1, 1872, 9 Fairfield was purchased from George Gibson by Fanny Pope (Hovey) Morse, the wife of John Torrey Morse, Jr. 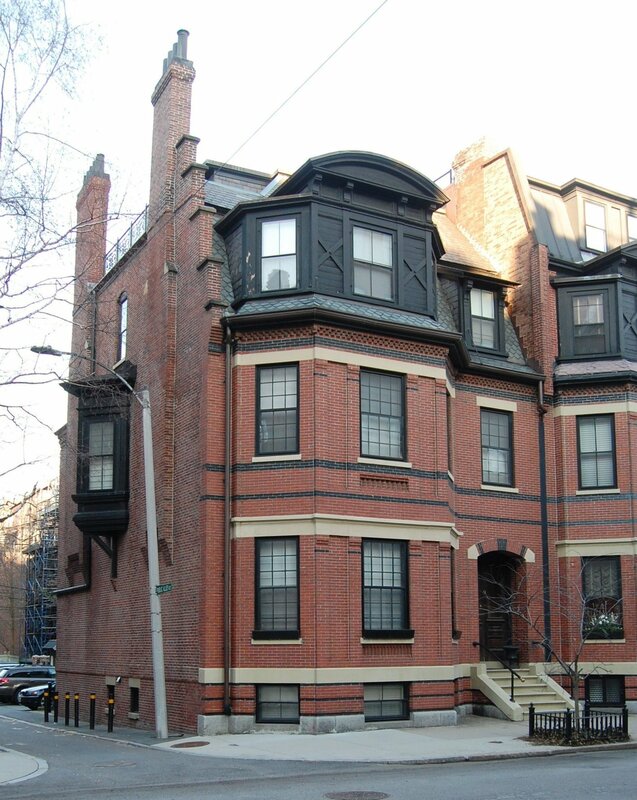 They previously had lived at 100 Beacon with her parents, George Otis Hovey and Mary Leveley (Cotton) Hovey. John Torrey Morse, Jr., was an attorney, historian, and biographer. He was a lecturer in history at Harvard in the late 1870s and for two years served with Henry Cabot Lodge as co-editor of the International Review. He also was editor of the American Statesmen series of biographies. 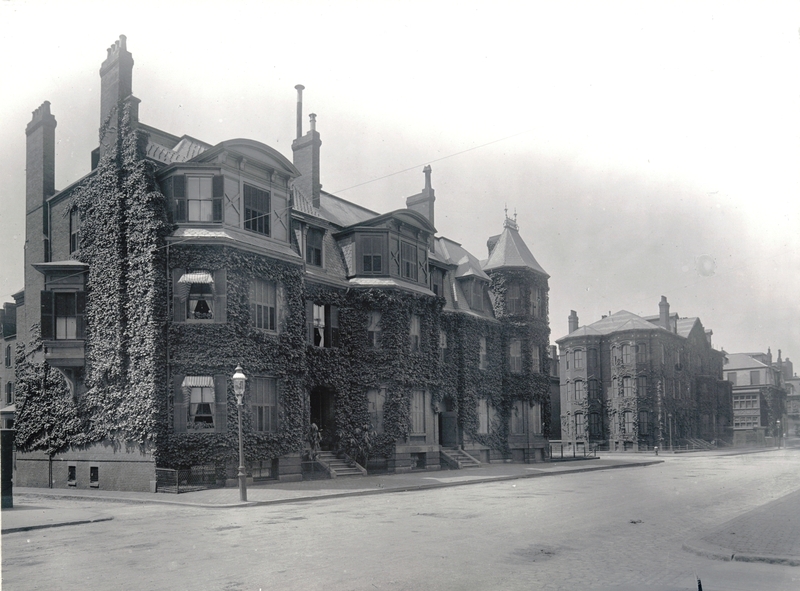 The Morses continued to live at 9 Fairfield during the 1884-1885 winter season, but moved soon thereafter to a new home they had built at 16 Fairfield (276 Marlborough). They continued to own 9 Fairfield and lease it to others. By the 1885-1886 winter season, 9 Fairfield was the home of attorney and mining investor Horatio Ripley Bigelow and his wife, Anne Lenthal (Smith) Bigelow. They had lived at 256 Beacon during the previous season. They also maintained a home in Hanover. Horatio Bigelow died in October of 1888, and Anne Bigelow continued live at 9 Fairfield. Their unmarried daughter, Adeline, lived with her. By 1892, William Alliston Ley Bazeley was living at 9 Fairfield as a boarder with Anne Bigelow. He was a clerk in the offices of her son, Albert Smith Bigelow, a mining investor and developer. Anne Bigelow died in August of 1897. 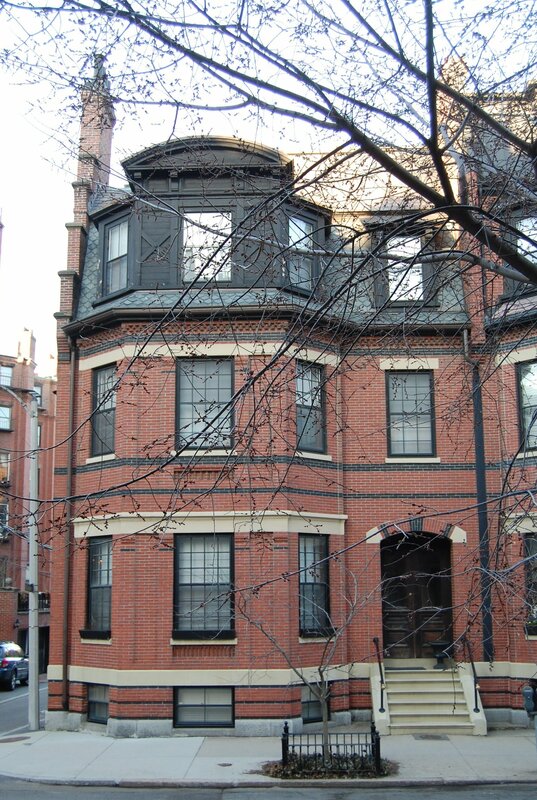 William Bazeley continued to live at 9 Fairfield until his marriage in September of 1899 to Margaret Chapin. After their marriage, they lived at 306 Beacon. He subsequently became a real estate investor and later served as a member of the State Legislature. 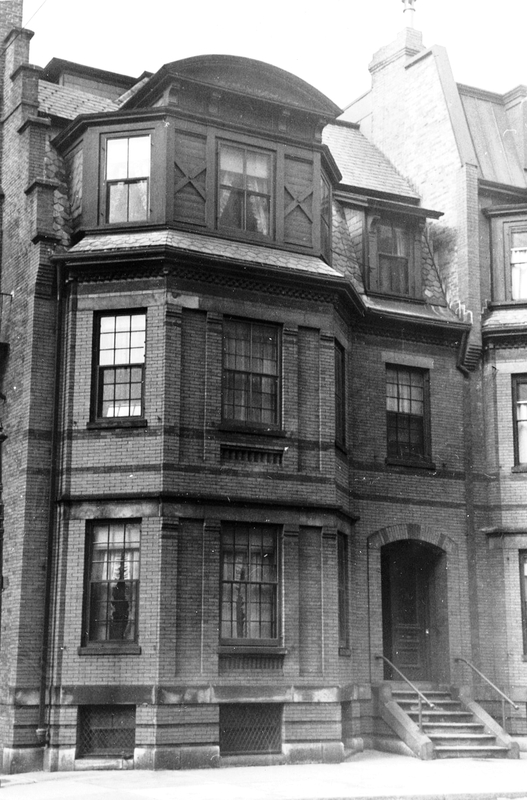 Adeline Bigelow continued to live at 9 Fairfield until her death in March of 1915. By the 1915-1916 winter season, 9 Fairfield was the home of Anita (Jones) Pratt, the widow of real estate broker William Pratt, and Miss Lucia B. Cutts, a lodger with her. They previously had lived at the Hotel Agassiz at 191 Commonwealth. They continued to live there until Anita Pratt’s death in February of 1931, after which Miss Cutts moved to an apartment at 250 Commonwealth. By 1932, 9 Fairfield was the home of Anita (Jones) Pratt’s nephew, Robert Jones Clark, and his wife, Harriot (FitzGerald) Clark. They previously had lived at the Hotel Royal at 295 Beacon. Robert Clark was the son of Robert F. Clark and Marguerita (Jones) Clark, Anita Pratt’s sister. He was a real estate and insurance broker. On September 19, 1940, 9 Fairfield was purchased from Charlotte Silber Morse by Harriot Clark. Robert and Harriot Clark continued to live at 9 Fairfield until shortly before their deaths, his in August of 1960 and hers in December of 1960. 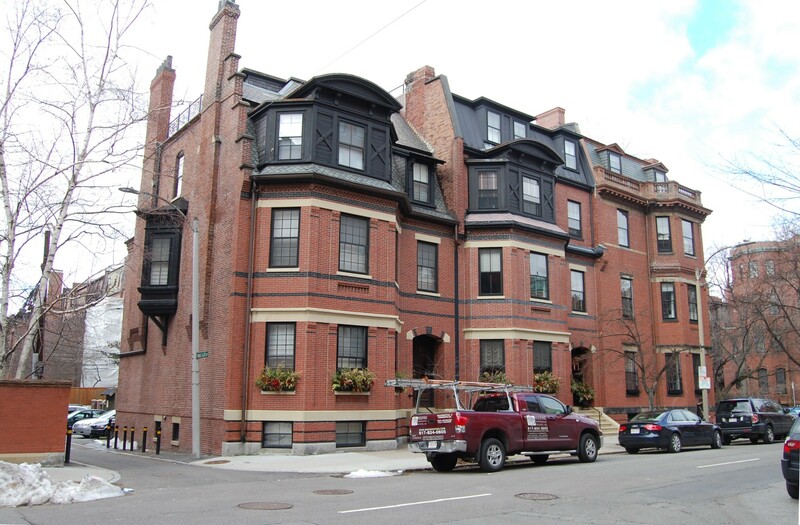 On September 16, 1960, 9 Fairfield was purchased from the estate of Harriot Clark by Henry J. Meagher, a real estate dealer and owner of the Hi-da-way Restaurant at 3 Boylston Place. He lived in an apartment at 3 Arlington. On May 8, 1961, 9 Fairfield was acquired from Henry Meagher by Edwin Conant Bacon and his wife, Adelaide (Smoki) Ruth (Ginepra) Bacon. They previously had been lodgers at 17 Marlborough. In October of 1961, the Bacons applied for (and subsequently received) permission to convert the property from a single-family dwelling into a two-family dwelling. On March 15, 1999, 9 Fairfield was purchased from Smoki Bacon by Jeffrey O. Nyweide. In July of 1999, he applied for (and subsequently received) permission to remodel the property, including removing the fire escapes, and convert it from a two-family dwelling back into a single-family dwelling. The property changed hands, remaining a single-family dwelling in 2017.